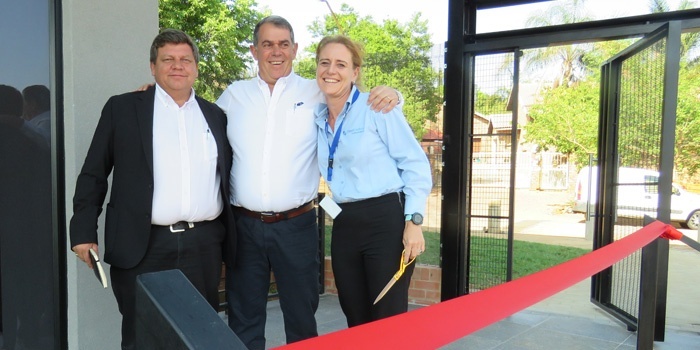 Jacques Wessels, CEO, FlowCentric Technologies officially opened the newly built Sable House building at a ribbon cutting ceremony held this morning. Since 2000 the FlowCentric Group of Companies has expanded to include FlowCentric Technologies (Pty) Ltd, FlowCentric Mining Technology (Pty) Ltd, FlowCentric Solutions (Pty) Ltd and a 20% ownership in Guideline BizTech (Pty) Ltd. The four organisations will be operating from the recently built offices at 500 Makou Street, Monument Park, Pretoria, as of October 2016. “This move is a culmination of years of hard work, dedication and loyalty from our management, team, customers and partners.” said Wessels at the opening ceremony. “With our new headquarters in Gauteng we are able to provide a safe and welcoming environment for our team, and the opportunity for more collaboration between the four companies.” Jacques Wessels explains. The new building borders the Groenkloof Nature Reserve, providing not only the ideal opportunity for employees and guests alike to do some game spotting, but also a beautiful view of several historical monuments in the Pretoria area. “We expect that there will be a lot more braais (barbeques) after work.” Wessels says with a grin. In the spirit of change and progress, the FlowCentric Technologies corporate branding has been updated. The organisation is maintaining the black and blue BPMN symbols for which they have become known. “The change in depth, illumination and perspective of the icon is representative of how we, as an organisation continuously align ourselves, our strategies and outlook to the future, while never forgetting where we came from, or the core values that have stood us in such good stead over the years.” concludes Wessels.